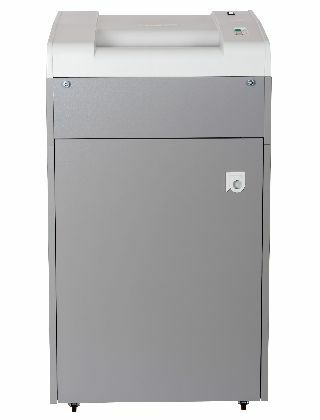 Dahle Shredder 20390 is a heavy-duty strip-cut shredder ideal for busy mid-sized office environment with a 50 gallon wastebasket. It features a 16" wide feed slot and can shred up to 45 sheets into 1/4" strips at a time with the speed of 22 feet per minute. It can shred staples and paper clips. It also features indicators for door open, bag full, and overfeed, a reverse button to clear paper jams, and an automatic start/stop function, and it will not operate when the door is opened to prevent injury. It includes ability to choose between automatic and manual operation.